CEO Balkrishna says new plants of the firm will ramp up production capacity to Rs 60,000 crore from the current Rs 35,000 crore. New Delhi: The demand of Patanjali products exceeds the supply and to handle this mismatch, the company is ready with a bigger and a better growth strategy, the FMCG firm has said in response to a media report that said the company is facing a slowdown in its sales. Citing a Credit Suisse study, The Times of India reported that the Baba Ramdev-run company’s revenues were flat in the financial year 2017-18. “The findings of the report are misleading. The consumer off-take has not gone down even for a single category,” Acharya Balkrishna, CEO of Patanjali Ayurveda, told ThePrint. “I agree that we faced a slump after the introduction of Goods and Services Tax (GST) but the entire industry was then impacted. There is no impact on consumer off-take. In fact, we are unable to increase the supply of our products to match the excessive demand,” he said. Balkrishna, who has been ranked 274 in the 2018 Forbes’ list of the World’s Billionaires, said his company is ready to increase manufacturing at the company’s new units at Nagpur, Tezpur and Indore. “We are in a transition phase which is making us future-ready. Our new plants have started sharing the load of the Haridwar plant,” he said. “For instance, Tezpur (Assam) has started producing cosmetics, herbal medicines and some of the food categories. We are in a hurry to complete the plant in Noida as well,” he added. The company also says it is quite confident of its growth trajectory. “These are not small units; these are mega food parks. Why would we build them if we will have weak demand?” Balkrishna asked. “These parks will boost our production capacity to Rs 60,000 crore from Rs 35,000 crore at present. We have doubled our team size for sales and marketing professionals,” he maintained. According to the report, Patanjali is facing a consumer off-take slowdown after its turnover shot up five times to Rs 10,000 crore in the financial year 2016-17 from Rs 2,000 crore in 2013-14. However, the revenue in the 2017-18 fiscal year was flat. It says that while the company continues to hold control over its toothpaste brand Dant Kanti and ghee, incremental gains in these categories are said to have declined. Ramdev, on several occasions, has said that he sees Patanjali growing 100 per cent year after year. 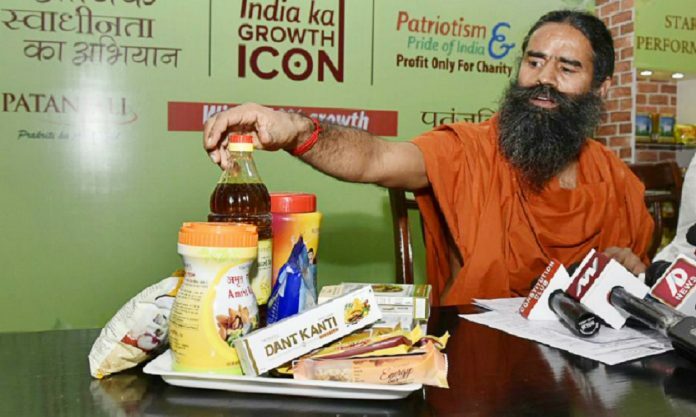 “We would grow more than double this year… By next year, Patanjali would be in the leading position and in most of the product categories, it would be number one,” Ramdev had said in May last year eyeing a turnover of Rs 20,000 crore. However, the company failed to register the expected turnover and blamed GST and demonetisation for the slowdown in its sales. “We have lined up several launches ranging from Khadi and denim apparels, packaged drinking water and dairy products. We are no more a small firm and we are trying to adopt a strict and professional environment.” Balakrishna said. “We are strategising our moves and we will continue to grow much better than our competitors. It could be 100 per cent growth or some notches less than that but certainly the best in the industry,” he said.